The answer seems to be Eastern China, in the mountains to the west of Shanghai. Although there have been various suggestions of earlier dates, and of the possibility of the ginkgo being indigenous to Japan, the first reliable records suggest that the tree came to be known in the early 1000s (Sung dynasty), in the Xuangcheng province of Anhui region. It was cultivated almost immediately, but it takes a long time for a planted tree to begin to bear seeds. It became more widely known over the next couple of centuries, so that a book published in 1313 was able to complain that ginkgo seeds no longer had their former (rarity) value. Unfortunately, it's still not clear whether the tree was discovered in a truly wild state in 10-something, or whether it had been cultivated in the backwoods of China for centuries before. After all, this was a thousand years ago. Unfortunately, it's also still unclear whether the tree survived in the wild into the last thousand years. There appear to have been intermittent reports of discoveries (which sometimes surface in web pages that talk about the ginkgo being "discovered" in China in the 1700s), but none are consistently confirmed. So when did it come to Japan? Sometime in the middle ages. The conventional answer given by most dictionaries is that it arrived with Zen buddhism in the Kamakura period (1192-1333), but the paper by Mayanagi suggests it is more likely to have been in the following Muromachi period (1392-1573). The evidence for this later date rests mainly on the absence of mention of the ginkgo in earlier times, so it is admittedly negative. On the other hand, the evidence for an earlier date isn't too strong either: partly it relies on an argument about the origin of the name which is by no means clear cut. Of course, there are claims that the ginkgo has been in Japan much longer than this, but the evidence for this is mostly in the form of stories of particular trees that are 1500 years old, or even more. None of these has been borne out by systematic investigation. "Living fossil"? Its seem that fossils of the ginkgo family were known before Kaempfer made his discovery, though he was probably not aware of this. Scholars in the West would have been excited to find the tree still living, but there was then no evolutionary theory to fit into. The "living fossil" term itself was not coined until Charles Darwin a couple of centuries later. This is the real mystery. The name "ginkgo" appears to go right back to Kaempfer, but it is certainly odd. English dictionaries usually just say it is from the Japanese ginkyo, but this doesn't make it obvious how the second 'g' got there. Let's try to unwrap this, starting from the Chinese. English words above the characters gloss the meaning. Even if you do not read Chinese characters, actually seeing them may help to sort out one or two possible misconceptions. For convenience, I'll refer to them by the English glosses of individual characters, thus "duck-foot" and so on. Sorry, I'm being inconsistent. A constant problem is how to represent so-called long vowels in Japanese. The most standard way is to use a macron over the vowel; unfortunately this is the method most incompatible with HTML. One alternative is "word-processor romanisation" which I've used for ichou, directly representing the three syllables shown in kana (i-cho-u). The "worst" way is just silently to drop the long vowel, which unfortunately I seem to have done for the ginkyo reading, which should properly be ginkyou (for example). The diagram above is an attempt to illustrate how, over the centuries, the various names for this plant have slid around (as words do). The Chinese have used three names in total: "duck-foot" for the tree, then "silver-apricot" for the fruit, and finally "white-fruit", with "silver-apricot" referring to the tree. The readings in the diagram above are the modern (Mandarin) Chinese, in pinyin romanisation, but different Chinese languages will have varying readings: for example, it's a safe bet that the name Cor Kwant gives for Singapore, Pakgor is a southern Chinese reading of the "white-fruit" characters. The first mystery: Japanese. 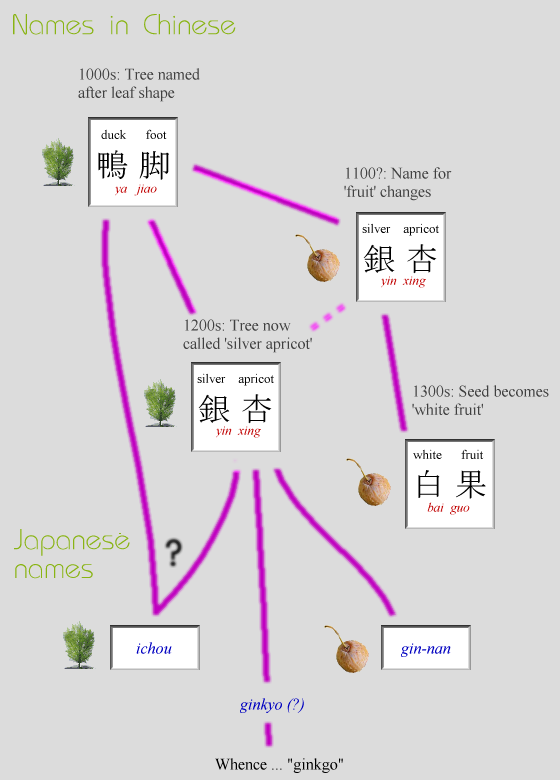 In modern Japanese, the tree is (invariably) known as ichou, and the fruit as gin-nan; though usually written in phonetic script, both of these wildly different readings can be represented by the "silver-apricot" characters. The question is: where does the ichou reading come from? The conventional theory in Japanese dictionaries is that it comes from "duck-foot", of which the Cantonese reading is ichao. The fact that this name had disappeared in China by the 1200s is used to support the theory that the tree must have been brought to Japan in the Kamakura period. But Mayanagi points out in his paper that the Japanese ichou reading could equally have come from a southern Chinese (Wu) reading, roughly ichau, of "silver-apricot". This is all a game of "Chinese whispers", and it's not difficult to see even the modern Mandarin readings (ya jiao and yin xing) getting muddled up. But what about ginkyo? This is not a normal way to read the "silver-apricot" compound, at least at the present time. But the separate readings gin and kyo(u) exist for the two characters, so it is possible as a sort of "learned" variant, and appears as such in the very largest of dictionaries. I can't find anything to suggest, though, why Kaempfer should have heard this variant name. What is incontrovertible is that Kaempfer somehow wrote down the name in a way that ended up as the Latin name "Ginkgo", but it is nonetheless true that this is a very odd combination of letters. Many people have noticed that it could mean that he wrote the standard Hepburn romanisation of "ginkyo" (dropping the long vowel macron), and the piece of paper got sufficiently crumpled by the time it reached Holland that it was misread as "ginkgo". This isn't as clear-cut as it sounds, though. For a start, Hepburn romanisation was invented by the missionary James Hepburn (1815-1911), so couldn't have been known by Kaempfer. Largely, he can be expected to have improvised his own system. In fact, since there were very few English speakers around at the time, it's extraordinarily unlikely that anyone would have chosen 'y' to represent the semivowel, and it is more likely to have been replaced by a 'j'. This, of course, could have been the basis of a different confusion, but it has also been suggested that since Kaempfer came from northern Germany, where there is a soft 'g', he might indeed have used a 'g' to spell what sounded like 'ginkyo'. So the details here are very unclear. "From the Japanese Ginkyo which is the Japanese name of the Ginkgo's seed. This term is thought to come from a phonetic spelling of the Chinese ideogram yin-hsing which is pronounced guinnkyo." Having the actual Chinese characters to look at (above), it's perhaps more obvious that "a phonetic spelling of an ideogram" is basically nonsense. Normally, the only thing that can be romanised is a pronunciation, and this has to be either the Chinese or Japanese pronunciation in this case. (The only other possibility is to consider the gloss "silver-apricot" to be a sort of romanisation.) When we consider the likely possibilities for what Kaempfer actually heard, it surely has to have been this somewhat nonstandard Japanese reading of ginkyo. "Maidenhair fern is named for its roots, which have fine, dark hairs. It prefers wet soils and rocky places, so a streambank would be a good place to look for maidenhair fern." "[Mellors says] 'Look at Jane, in all her blossoms!...Pretty little Lady Jane'... and kissed her maidenhair." It's fairly clear that Lawrence is using "maidenhair" to refer to pubic hair. It's also interesting to note that the specific name of the maidenhair fern, Adiantum capillus-veneris, refers to "Venus hair". Hmm. Well, it turns out that "Venushaar" is another name for ginkgo in German, Dutch, Danish, and so on. And a web search soon turns up this word in its obvious "colourful" context - it's included in this list of sixty(!) German synonyms for the "unteres magisches Dreieck". Other names - there are quite a few. Perhaps it's particularly worth mentioning the alternative Latin designation "Salisburia adiantifolia", proposed to honour Richard A. Salisbury, another botanist. The 'adiantifolia' presumably refers to the generic name Adiantum of the maidenhair fern, though this is odd, since the fan-shaped leaves are not a defining characteristic of the genus, and I don't believe 'adiantum' itself has anything to do with the shape at all. Then in French it can be called "l'arbre aux quarante ecus" or the tree of forty crowns (meaning: expensive), and various translations of "temple tree". Cor Kwant's site includes a comprehensive list of names with even more. Even more than other of these pages, I'm aware that this has many loose ends and unfinished business. I still have to get down to photographing the flower stage. I have also failed to find any information about early romanisation of Japanese, beyond a tantalising reference to the "missionary system". And I still haven't managed to read any of the original writing of Kaempfer. If you can make any suggestions, please use any of the feedback links below. The Ginkgo Pages - Cor Kwant's comprehensive site, in Dutch, English, and German versions. Includes the original and an English translation of the ode to the ginkgo by Goethe, who got very worked up about the incipient division of the leaf into two lobes. I also couldn't help spotting the Dutch word for dioecious, which is "tweehuizig" (i.e. "two-house-ish"). Much easier to remember! Wayne's Word: Plants of Jurassic Park - a nice page of "living fossils". Ginkgoales: Fossil Record - fossile ginkoales from the Museum of Paleontology, Berkeley. herbsforhealth.about.com entry claims "seeds are toxic" and should not be eaten. Not quite botany - a second species Ginkgo webola discovered living in Wisconsin with her husband! Ehime Shinbun article that repeats the standard argument that ichou must come from yachau, the "duck-foot" name, and therefore the tree must have arrived in Japan in the Kamakura period. Bodo Manitz - ginkgo fossils and Kaempfer's discovery. Prof. Dr. Walter Jung - Munich paleontologist's page. Bernard Langellier - includes the bit about Kaempfer mistranscribing 'y' as 'g' ("...On ne put jamais convaincre les botanistes de corriger cette erreur.") and a story about how the "Tree of 40 ecus" name arose.